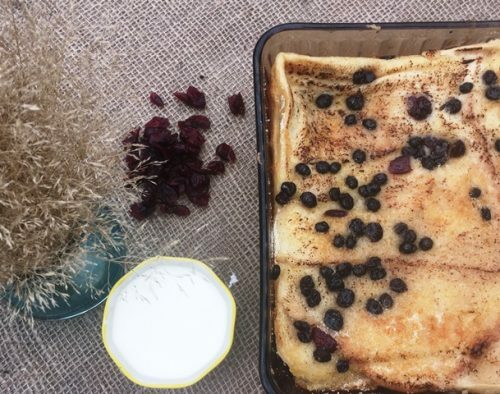 A simply scrumptious old English favourite with a burst of cranberry flavour for a slight twist and so easy to make for an al fresco delight. Butter the bread and cut in to triangles. Grease the sides and base of a deep baking dish. Layer the bread slices in the dish. Sprinkle the currants and cranberries in between each layer of bread. Pour over the bread so the liquid just covers the top layer of bread. Place lid or foil over the top and put in the top oven on the stone. Bake for 40 minutes. Remove the lid and bake for another 10 minutes for the top to go golden brown.